Sharman Apt Russell – as a teacher and a writer – has an had enormous impact on my own writing life. From her encouragement to ask “fruitful questions” to her ability to describe natural phenomenon with such detail that their beauty and power take my breath . . . she is one of the writers I most admire. Her book Standing in the Light: My Life as a Pantheist was one I savored for its richness. And today, I am honored to share an interview where she talks about her new books, her way of living in the world, and her philosophy on writing. Oh, that makes me feel like the Egotistical Bore at the party that everyone else is avoiding, with you a naïve and unsuspecting victim. Writers pounce on that opening! Well, okay…a book I have been writing for the last three years, Diary of a Citizen Scientist: Chasing Tiger Beetles and Other New Ways of Engaging the World , has just been released by Oregon State University Press. That remains a project in the sense of giving readings and writing a few blogs—and continuing with my own citizen science work looking at the seasonality of plants for Nature’s Notebook and monitoring archaeological sites for the New Mexico Site Steward Program. Citizen science remains a part of my life now. I am also preparing for the release of my first Young Adult novel in the spring, Teresa of the New World (Yucca Press, March, 2015), and revising a companion novel for that book, The Salt Journey of Red Water Running. I’ve been writing children’s literature for a long time, in-between the adult nonfiction, and in the next two years I will have another middle-grade fantasy published by Yucca Press (an imprint of Skyhorse Publishing) and a YA/science-fiction. I’m pretty excited. I’ve started a book group called “YA and MG, Seriously” on Goodreads where the premise is that writers write children’s literature because that is the best art form for what they want to say and readers read children’s literature because those literary conventions speak to their needs. We will read all genres but with a focus on those that meet a certain literary standard—which we are free to decide for ourselves. In terms of new work…I’ve just started what will be in the very long-term a collection of essays on the psychic, numinous figures who live inside us (in my case, my father, Cabeza de Vaca, Virginia Woolf, a Paleo woman), and I’m starting to prepare for a nonfiction book which focuses on childhood malnutrition in Malawi. That will involve going to Malawi next fall. If all this seems weirdly scattered, a bit too much—it’s not, really. The book on Malawi builds on my previous book Hunger: An Unnatural History . Citizen science builds on all my nature and science books. Children’s literature was my first love—ever since I was a child. So all those projects feel organic and ongoing. Huge. If you have a pretty happy childhood, reading can enrich and complicate your life in the best way. If you have an unhappy childhood, reading can save you. You are not alone when you read. You see the possibility of other lives, the possibility of story and imagination, and you become bigger than yourself, other than yourself, which is just what you want. Because I loved reading, because I wanted to be part of that world, I decided I wanted to be a writer when I was eight years old and never wavered. Having that sense of purpose and direction was certainly helpful in in my teen and young adult years. And then the actual writing, of course…the flow of the creative state, the mystic playfulness of fiction when you are everything and everyone, the connection to your unconscious or dream state, the quest for authenticity, the particular challenge of being honest and clear in nonfiction, the way that writing helps you follow questions and uncover insights and discover new things in the world and in yourself. Writing offered me so much, and still does. I try to write as soon as I get up in the morning, between 5:30 to 7. I drink delicious coffee and write for as long as I can, until the demands of the day interrupt that. Sometimes I only get an hour or two, sometimes more. The weekends don’t interrupt this. I don’t think of writing as part of a work week. Writing is every day. I’m just about to read a collection of essays, The Braindead Megaphone, by George Saunders. I loved his stories Tenth of December. I will also be reading Abigail Thomas’s A Three Dog Life. And I’m plunging into some Young Adult: Going Bovine by Libba Bray and In Darkness by Nick Lake. Mrs. Dalloway, Virginia Woolf. The way consciousness moves in the text from one character to the next, from a plane in the sky to an ocean wave, the leaping quality of the words, and the ordinariness of life twined with all that sorrow and grief and madness, the way life is. The Account: Alvar Nunez Cabeza de Vaca’s Relacion, originally written as a report to the King of Spain by Alvar Nunez Cabeza de Vaca. The edition with this title was translated by Martin A. Favata but is just one of many translations I have read. The sixteenth-century Spanish conquistador Cabeza de Vaca was shipwrecked near present-day Tampa, Florida in 1528; lived as a slave, trader, and shaman among the coastal tribes of Texas for nearly eight years; and eventually walked west to the outposts of New Spain in order to return to Europe, come back to the New World again, and finally die at home in Spain. This glimpse into a pivotal time of our history—First Contact—is so extraordinary, filled with anthropological detail, ironic, weird, surprising. My protagonist in Teresa of the New World is the fictional daughter of Cabeza de Vaca. I am just now starting to do that now. I retired a few months ago from full-time teaching at Western New Mexico University in Silver City, NM and didn’t feel I had the time before. I still teach part-time at Antioch University in Los Angeles and as a visiting writer elsewhere. And I’ll keep teaching a few classes at WNMU. So that makes me wonder—do I have the time now? And the answer is yes because I understand its importance in today’s writing world and because I am focusing on social media that feels authentic to me. The posts for Facebook, the newsletter for my website, the Goodreads book club—they are natural, not forced. I could do more but that’s where the balance comes in; building the platform has to feel and look (most of the time) like a continuation of the actual writing. For me, this includes answering emails and queries from readers, who are my colleagues, after all, the other half of the conversation. Writing in the morning. The business of writing in the later morning. Lunch with my husband or friends. Various commitments the rest of the day having to do with writing and teaching, citizen science, maybe some environmental work. Definitely exercise of some sort. For the last year and a half I’ve been training for the Olympic triathlon: six mile run, twenty-four mile bicycle, one mile swim. I didn’t want to travel for the event, so my friend and I just did it at her home last month in early October, using her lap pool, not competing with each other or with ourselves, and taking a break for killer expresso. It felt good being this strong—and I won in my age group! Which was exactly 60. And which was comprised of only me. It would sound much like my actual life, a space that includes natural beauty out the window and breaks for physical activity. Although…I am interrupted throughout the day by my husband and other family, and there is a fair amount of business to do, and a certain expectancy to the day—I don’t feel I can suddenly start writing in the middle of the night or keep writing through a planned lunch. I’d like to try out that freedom, perhaps at a writer’s residency. I imagine, of course, that I would still sleep through the night and eat lunch just as I planned. But it’d be fun to have longer stretches without interruptions and see what happens. Oh, gosh. In 1994, I had an editor at Knopf tell me to change my children’s novel from three different points-of-view to one, and I sensed that they might not publish the book otherwise. So I did, and it probably made the book better. My editors at Perseus Books usually had good suggestions for the books they published– Anatomy of a Rose and An Obsession with Butterflies and Hunger and Standing in the Light—but it was still always painful to look at their comments and think: more work to do? Really? The hardest writing critique, of course, is a bad one in which the editor tries to change your very style, your voice, your word usage, your transitions—the death of a thousand cuts. That can happen at some magazines and, in the end, you may decide just not to write for that magazine or editor anymore. Hum. I think it’s wise to see writing as living. It’s the way you are living your life. It’s how you engage with the world and how you think about things and how you deepen your relationships and how you keep centered and honest. In the act of writing, you become your best self. In the act of writing, you challenge yourself. I try not think of writing in terms of money or career or approval or status or even identity. (I have to work pretty hard at this, of course.) Writing may be related to these things, or it may not be. But essentially, writing is a way of being conscious. Writing is this conversation I am having with myself about the mystery of existence. 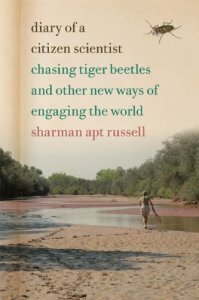 Sharman Apt Russell is pleased to be considered in the book world as a nature/science writer. At the same time, she has relied on Joseph Campbell’s advice to follow her bliss. She writes about what engages her, what she can learn from, what seems important. Her topics include citizen science, living in place, archaeology, flowers, butterflies, hunger, and pantheism. 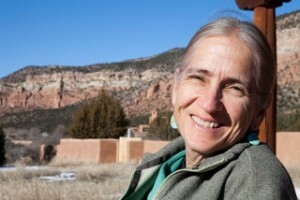 Read more about her and her work at her website – http://www.sharmanaptrussell.com and like her on Facebook.